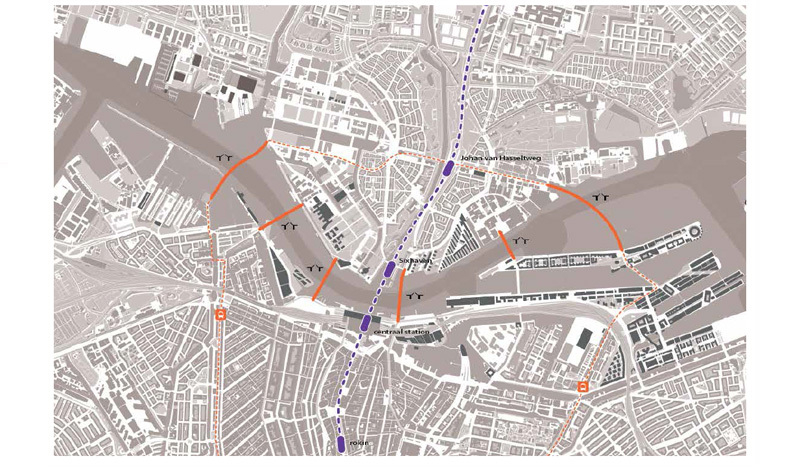 Earlier this week I published a post about the new tunnel in Amsterdam that leads people walking and cycling to the ferries to get across the river IJ to the North of the city. So why don’t we have a good look at these ferries? People disembarking from the ferry in Amsterdam. The coloured areas are a very successful way of influencing people’s behaviour without signs: people intuitively understand that they have to wait on the green areas which makes disembarking possible on the red area. There are currently 6 ferry lines across different parts of the river (or lake) IJ, which can only be used – at no charge – by people walking and cycling (and people on scooters/mopeds and mobility scooters). Three of these ferry lines start north of the Central Railway station. The ferries carry 45,000 people per day. During rush hour they go every 4 minutes. on the busiest line, which is also the oldest. This is the “Buiksloterveer” which was first mentioned in written sources in the year 1308, but it must have been older. That makes this ferry line one of the oldest public transport lines in The Netherlands. That the ferry is still there is actually very strange. Apparently Amsterdam is the only Dutch city on a river that has no bridges over that river! In an essay about this remarkable fact it is noted that this makes Amsterdam the only Dutch river city that has no possibility for people walking or cycling to cross the river on their own. The writer adds “it is even stranger that nobody in Amsterdam seems to think that that is strange. On the contrary; the very ordinary idea of a bridge across the river IJ sounds to many people from Amsterdam like a ‘wild plan’ that surely is technically impossible and that shouldn’t be brought up all the time”. 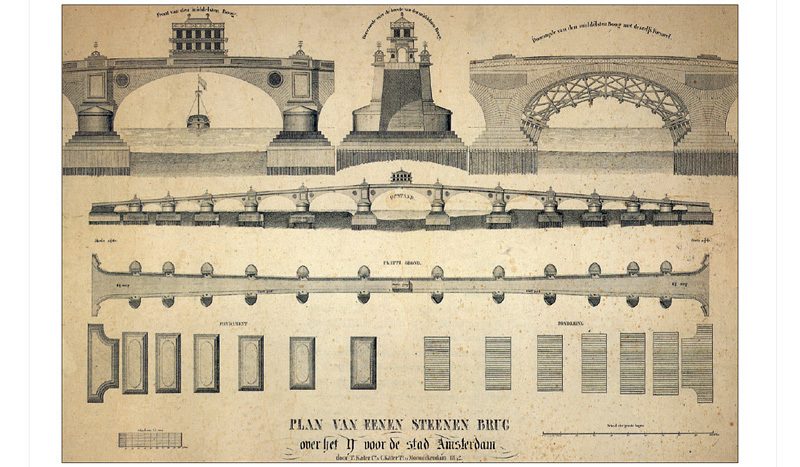 An older ‘Plan for a stone bridge across the IJ for the city of Amsterdam” that was never built. So many plans for a bridge were made in the last 150 years that never led to anything being actually built, that nowadays nobody feels a bridge could ever become a reality. Unbelievable in a country that has so much know-how about water works and where bridges of the kind that would be needed can be found in abundance! A bridge would have to be about 200 metres long and about 10 metres tall (with a part that could be opened for the occasional tall ship) Similar examples can be found in Nieuwegein or three (!) times in Nijmegen. And even Amsterdam itself has a cycle bridge that could be an inspiration. A cycle bridge across the IJ would cost about 20 to 50 million Euro. Certainly not much and recent calculations reveal that it is actually more expensive to not build one: in the long run ferries cost more! People riding onto the ferry to the North of Amsterdam. Possibly the oldest remaining example of public transport in The Netherlands. You can also wonder why there is no tunnel for walking and cycling. In the 1960s the IJ-tunnel was built, but only for motor traffic. Unlike the Maastunnel, built about 20 years earlier, that did get a great part for walking and cycling. The excuse is that the Amsterdam tunnel was built during the era of the private car when it was believed cycling would die out. But that doesn’t explain the second tunnel, the one for the North-South metro line. That tunnel was built as recently as 2012. It is so new that it will not even be used before 2018. That tunnel did also not get an extra tube for walking and cycling. A remarkably missed opportunity showing that Amsterdam did not think about people walking and cycling and their crossing of the river, even this recently. Again, the Rotterdam region did better, building a tube for cycling next to a motorway in 2002. 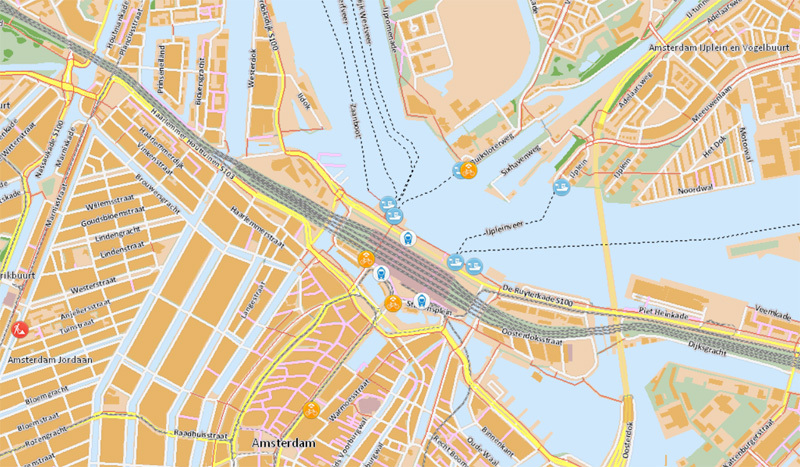 Possible locations of one or more bridges across the IJ in Amsterdam. But things may change. Amsterdam is finally and seriously studying a traffic connection across the IJ now. It has to, the ferries won’t be able to cope with the traffic volumes in the near future. 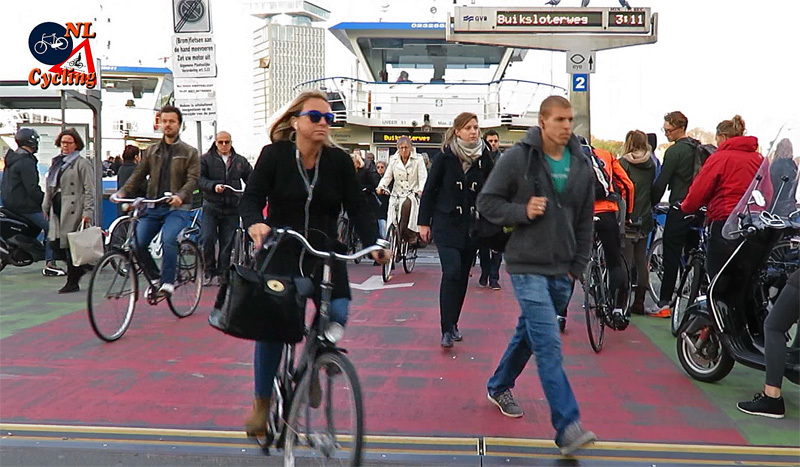 Because of the many developments in Amsterdam-North, the cycle traffic across the IJ increases by 6% per year. A total increase of 65% is expected by the year 2025. This leads to traffic volumes which can no longer be handled by ferries. To facilitate all that traffic all kinds of crossing possibilities in a large area are being investigated now. From bridges to tunnels and even aerial tramways with access for bicycles. Interestingly enough the city calls the aerial trams “a feasible solution”. One of the proposed aerial tram lines is called the “Amsterdam Tulip Line” with some interestingly shaped masts. To be honest, this looks more like a fun ride to me, than a genuine transportation option to quickly get from A to B.
But… for the time that Amsterdam stays the only Dutch river city without a bridge, the ferries will continue to take people across the water. It has a nice side too: it looks amazing to see all those people boarding and disembarking the ferries. So I made a video showing just that, for you to enjoy! This is the same area next to Central Station during evening rush hour. Note: Anyone who pronounces every “t” in Toronto is a tourist. Excellent post Mark! It contains every detail I always wanted to know about the ferries, but were to lazy to ask someone or search for it. 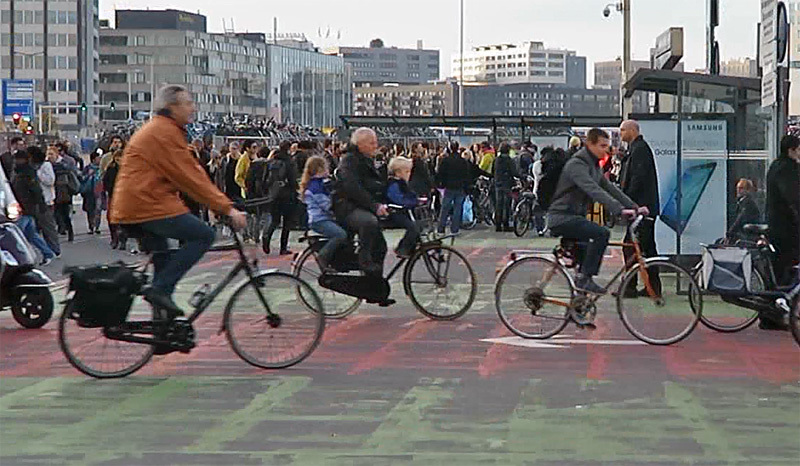 It is remarkable indeed that Amsterdam never built tunnels for cyclists, as Rotterdam has done repeatedly. I remember riding that ferry a few years ago and it was really nice. A different experience than a bridge. More interaction with other people even if it’s just non-verbal standing next to each other. Here in British Columbia, there is always talk of bridges to Vancouver Island however it would be an enormous engineering feat if it every happened but I much prefer the ferries. You get to walk around, have brunch, look at the view, hear multiple languages spoken around you, take pictures, and again negotiate with others as you get on and off. It’s important for a society that people have opportunities to relate to others they don’t know. In places where driving is the sole transportation option, people can become isolated from each other and not have an opportunity to be part of society or learn the give and take of coexisting with other citizens. Excellent video as usual. Also an excellent “free” service. Trying to collect payment would really complicate and slow down the process. That’s a great idea about the different colored areas which the people intuitively use. I have a friend who has a PhD in “Usability Engineering”. She does that kind of work for an international airline. There are so many signs vying for our attention that people become immune to them. The countdown clock is cool. People know if they have time to board or not. Collecting fees would be very inappropriate, as driving your car in the IJ-tunnel is free of charge. Why should pedestrians and cyclists pay when car-drivers can get for free to the other side? Many ferries do charge such as the ones in Dublin and Seattle and Staten Island, for example. I think it is great that your ferries do not charge. The difference in attitudes toward cyclists is interesting as well. The Staten Island ferry website http://siferry.com/ sets forth the “Bicyclist Rules of Conduct”. Considerably different worlds. Great blogpost Mark. I absolutely loved the bit about Amsterdammers wishing everyone would stop asking why there wasn’t a bridge. One of my favourite memories of Amsterdam was catching the ferry and it having to stop on the IJ to wait for a huge ocean liner to pass on its way out to sea, and nearly all the locals on the ferry joyfully returning the waves to the passengers high up on the liner decks. So sweet, and as it turned out just the first of many personal experiences of the open friendliness of the Dutch people. I’m amazed that the quay has no barrier when there’s no ferry docked! In the Netherlands we have social security, so when somebody falls into the water. And injures himself, then he gets money from the Government. We don’t have lawsuits like the Usa. And I think everybody is taking his/her own responsiblily, by looking at the ferry. I’m sure lawsuits play a big part of it, there’s also some issues with policies lacking context. I’m sure that if people frequently fell into the river at those locations, eventually it would be worth putting something up to prevent it from happening. Sooner if people frequently were injured or killed. This happens in North America to some extent, but the problem is, it often takes the form of, oh, people fell in the river here, well, then all rivers everywhere must always have a barrier, no matter the context, or if its a frequent problem. For filming Mark, you could instead of a helmet cam or holding a phone, or mounting it on the handlebars, how about a sort of harness strapped to your head, disguised as a hat? 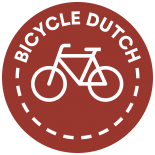 This entry was posted on 26 November 2015 by Bicycle Dutch in Original posts and tagged Amsterdam, ferry, watching people cycling.